This legislative session is a busy one for champions of LGBT equality in Illinois. With proposed legislation and a budget impasse that has the ability to significantly affect many in our community, now is the time to tell Springfield where we stand. Register for the 2016 LGBT Advocacy Day on Wed., April 13! 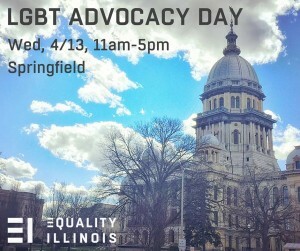 This daylong advocacy event in Springfield includes lobbying training, lunch, meetings with legislators, and a visit to the capitol and concludes with a reception at the Illinois State Library. This is a great opportunity to meet with fellow supporters of LGBT equality and let your voice be heard on a series of issues that affect us all.